Armed clashes in January 2019 between troops from the Karen National Liberation Army and Burma Army soldiers in Northern Papun District of Karen State. 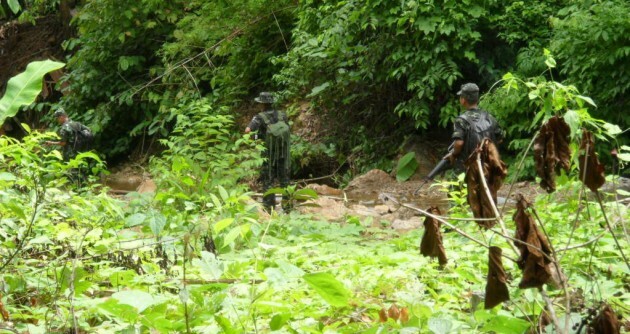 KNLA sources reported that two armed skirmishes happened on January 5 and 13 in the Karen National Union’s controlled Papun (Mutraw) area between the KNLA Brigade 5 and Burma Army units operating in the area. Major Saw Kler Doh from KNLA Brigade 5 told Karen News that the tensions that led to the armed clashes were because of Burma Army violating agreements not to enter restricted areas. The fighting this month happened in the Ler Doh Htee area in Lu Thaw Township between Ler Mu Plaw and Saw Mu Plaw village tracks. This is the same region where armed clashes broke out last year when the government reinforced its troops to build a contentious road despite not having a agreement with the Karen. In 2018 armed conflict displaced over 2,400 Karen villagers, with many until recently unable to return to their villages. The government’s Office of the Ministry of Defence issued a statement on January 8th stating that despite informing the local KNU of road repair works on January 1st, KNU troops attacked their soldiers building and securing the road on January 4, 2019. The MoD’s statement accused the KNU of destroying government road building vehicles. The Burma Army, despite claims it wants to make peace with ethnic armed groups, continues to wage conflict in Rakhine, Kachin, Shan and Karen States.